Olentangy’s Brooke Wells fires to first base to retire Liberty’s Marissa McPhail during Wednesday’s OCC showdown in Powell. Senior Morgan Cox found motivation from the sign hanging up in the batting cage at Olentangy. The sign is for the last time the Olentangy softball team captured an OCC championship – which was 2013. 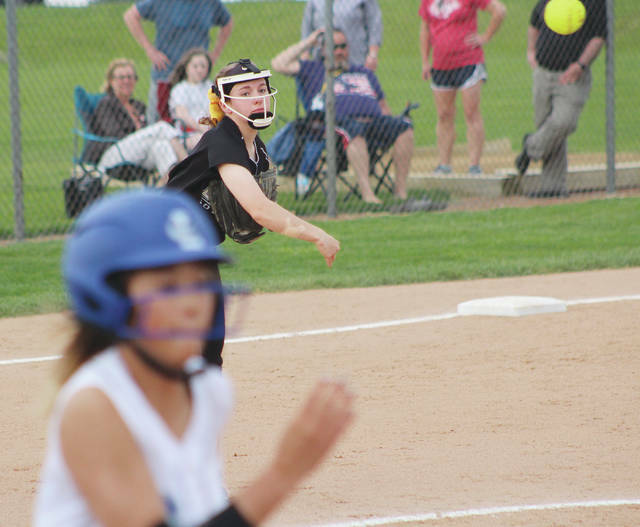 That motivation turned into a reality when she put Olentangy ahead to stay on a looping liner that found grass in short right field, driving in Brooke Wells with the go-ahead run in the 10th inning. Olentangy tacked on an insurance run on an Emily Bullock fielder’s choice and Sophie Low set the side down in order in the bottom half to nail down a 5-3 victory at rival Olentangy Liberty Wednesday in Powell. The win wraps up a share of the OCC-Buckeye championship – adding another sign that may one day serve as motivation for someone else. Morgan put it the same way as her sister Payton did after the win over Westerville Central Apr. 26. Olentangy (13-9, 7-1) holds a two-game lead over Liberty and Westerville Central with two games left to play. Liberty had come in under the radar after a 1-7 start to the season. But all of those games were outside of league play. The Patriots responded with a four-game winning streak and nine of their last 12 overall coming into Thursday’s game. Power has been a major reason for their success with first baseman Arica Flaugher clubbing eight home runs for the season. Thursday, it was Dani Schoenly and Lillee LaRosa that played long ball. Schoenly sent a towering drive over the left-center field wall to lead off the first to tie the game 1-1. LaRosa sent a deep drive over the wall in left to give the Patriots a 3-1 lead in the sixth. Morgan Cox sent a liner to the left-center gap and reached on an error to start the seventh. Payton Cox was intentionally walked for the fifth of six times in the game. Bullock laid down a bunt that was fielded and thrown into right field allowing both Cox sisters to score to tie the game 3-3 – sending it to extras. Low, meanwhile, gave up the two homers. She retired 15 of 17 batters after the first home run and 14 of the final 16 batters she faced. All told – she allowed three runs (all earned) on four hits and four walks and struck out 12 over 10 innings. Liberty’s Katelyn Wilhelm was almost as good. She went the distance and allowed five runs (one earned) on eight hits and nine walks (including six intentional) and struck out nine. Schoenly had two hits and a walk in her five plate appearances and scored two runs to lead the Patriots (10-11, 6-3). Olentangy has a trip to Westerville Central today at 5:15 p.m. A win there or win at Westerville North May 10 ensures an outright title. Liberty wraps up league play at Westerville South today at 5:15 p.m.